Nobody has an easy Agile transformation. Make yours easier. You touched almost every part, from framework to engineering to team dynamics to managers and leadership. I actually look forward to the mini-program emails... It's like little nuggets of hidden treasure. 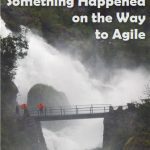 Get instant free access to the mini-program, Something Happened on the Way to Agile, plus a free subscription to Gil’s 3P Vantage Point ezine, containing articles and news, and other Agile-related communication.